Both NBC versions and the weekly syndicated version were hosted by Art Fleming. Don Pardo served as announcer until 1975, and John Harlan announced for the 1978–1979 show. 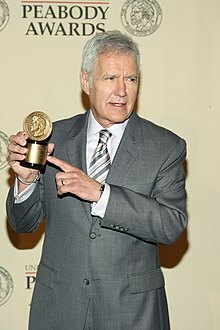 Since its inception, the daily syndicated version has featured Alex Trebek as host and Johnny Gilbert as announcer. The Jeopardy! and Double Jeopardy! rounds each feature six categories, each of which contains five clues, which are ostensibly valued by difficulty. The dollar values of the clues increased over time. On the original Jeopardy! series, clue values in the first round ranged from $10 to $50. On The All-New Jeopardy!, they ranged from $25 to $125. The current series' first round originally ranged from $100 to $500, and were doubled to $200 to $1,000 on November 26, 2001. 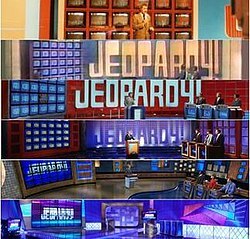 The second round, Double Jeopardy!, features six new categories of clues. Clue values are doubled from the Jeopardy! round. The contestant with the least amount of money at the end of the Jeopardy! round makes the first selection in Double Jeopardy! ; if there is a tie, the tied contestant standing at the leftmost lectern selects first. The daily syndicated version debuted on September 10, 1984, and was launched in response to the success of the syndicated version of Wheel and the installation of electronic trivia games in pubs and bars. This version of the program has outlived 300 other game shows and become the second most popular game show in syndication (behind Wheel), averaging 25 million viewers per week. The show's most recent renewal, in May 2017, extends it through the 2019–2020 season.